i have to admit, when i first saw this dress as one of the patterns in the colette patterns handbook, it wasn’t my favorite. maybe it was the pastel color scheme that doesn’t really suit me or just my own limited imagination. at any rate, i had some fabric i had bought for super cheap and decided to give this dress a shot. i started to really notice the feminine details: the curvy neckline, the tucks, the cap sleeves and thought: wait. that’s exactly what i need in a dress. plus, i had red fabric. red. everyone needs a red dress. sometimes my projects just decide themselves. so, let’s go over the details, shall we? 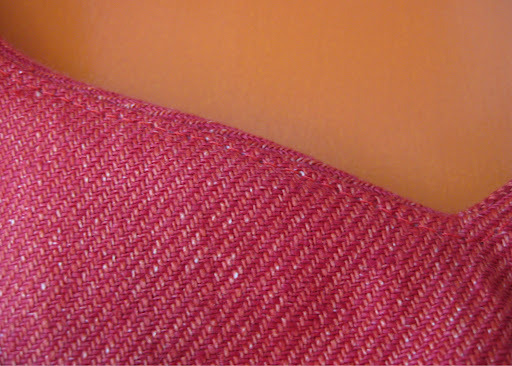 my material is a cotton rayon blend with a twill weave. while the material is medium weight, the weave is a little loose. 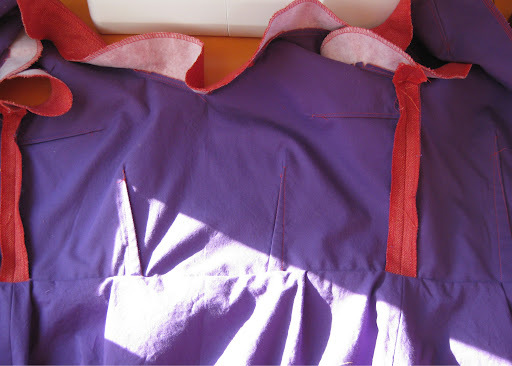 to keep everything in place, i underlined the bodice in a purple cotton broadcloth. this really helped while sewing to keep everything lined up. the skirt is lined with the same material as my underlining. the innards: pre zipper and pre tacking down of facing. the facings for this dress are crazy unruly beasts! as far as the pattern alterations went, i graded from a 0 at the shoulder out to a 4 at the waist. 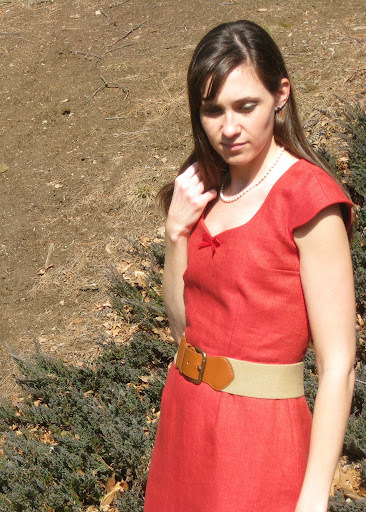 then i butchered the bodice to pieces (reducing it to a mere shadow of its former self) doing an sba like this. on the back bodice piece, i cut the whole thing a size 0 (size 4 in length though) and reduced the waist dart so that my waist measurement was still the same as the size 4. i also did a slight swayback adjustment, removing a 1/4″ wedge out of the back. nothing as major as i have seen in so many people’s versions though! i cut a size 4 skirt and added 1″ above the hip as my waist to hip measurement is longer than average. this also helped bring the hem down to a better length for me. this is really one of the best fitting dresses i’ve made. i could mess around a little with the shoulder because that is the one place where the fit isn’t perfect. 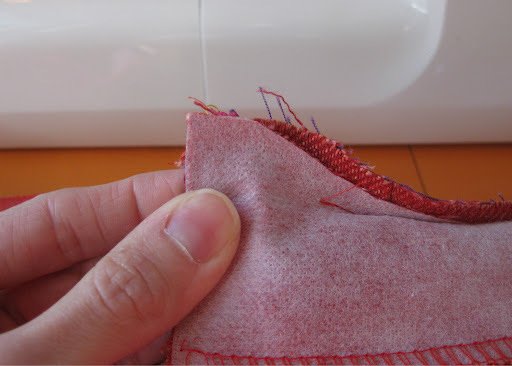 it’s also something that i can alter without a major undoing of stitches. now, as i mentioned on my macaron dress, i think i have weird shoulders. since this is just a cap sleeve it isn’t bothersome, but i can tell that i may need more material to reach my shoulder in the back, and less toward the front. it’s as if i need to rotate the armscythe forward half an inch or so. does this adjustment have a name? i really don’t know. i am so pleased with how this dress turned out. it was a snap to sew up, i only spent a couple days working on it. and by days, i mean naptimes and an hour or two in the evenings. so, don’t let some of the mixed reviews on the fitting of this dress throw you off. give this one a try, it’s perfect for spring. and yes, it’s finally spring! 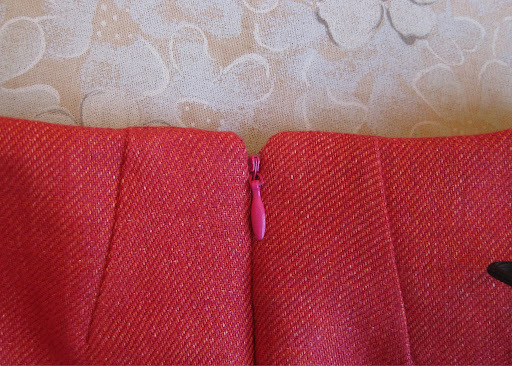 before i show off my lovely finished pastille, i thought i’d show you how to manipulate the lining around the zipper. for this one, i chose to underline the bodice and line the skirt. now, when i started sewing dresses and was trying to figure out how to put everything together neatly inside and out, i would study books and poke around dresses at shops. 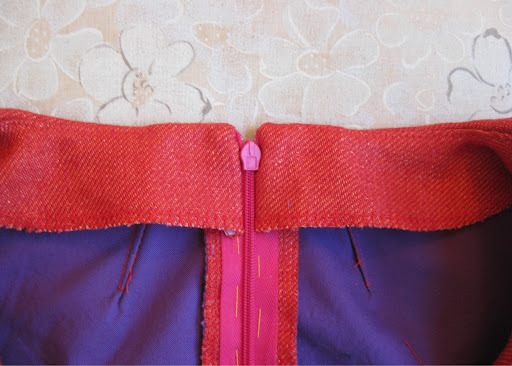 then when i discovered sewing blogs and burdastyle, even those who showed the insides of their dresses usually left out the construction around the zipper (probably for good reason!). and that’s what i always struggled with. 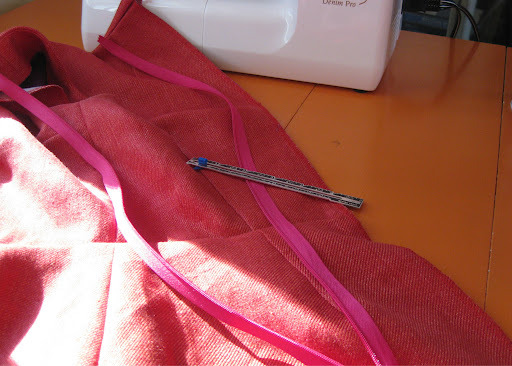 so, in this post i will show you exactly what i did with the lining around the zipper. it’s a very clean finish, and will hopefully be helpful to somebody. here is the inside before the zip is inserted. looking too orange. and cuz it’s fun. as i mentioned, i underlined the bodice. 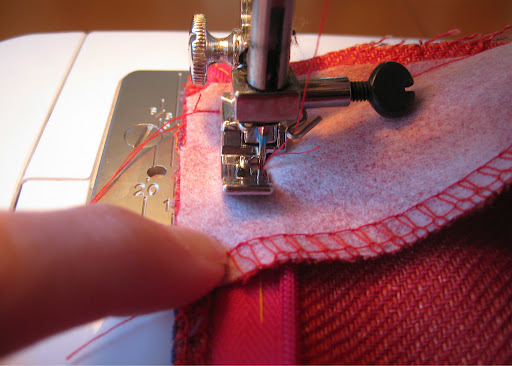 when you do that, and don’t include an additional lining, your seams will be visible. i’m okay with that on a casual dress such as this. 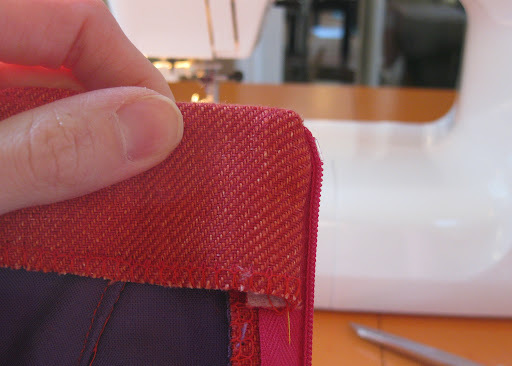 i serge all my seam allowances to keep the raw edges from fraying, but if you don’t serge i highly recommend seam binding. so my underlined bodice is attached to the skirt, then the skirt lining is sewn on. make sure to stop about 1.25″ from the zipper opening. i will want to sandwich the zipper tape between the shell and lining fabric once the zipper is in. now sew in the zip. i love invisible zips. i think they are the easiest to put in, provided you have an invisible zipper foot. considering you can get one on amazon for $5-$10, there’s really no reason not to have one! for this dress, the zipper is very long, so i will hand baste it in first. believe me, that is a lot of zip to screw up, it’s practically a mile long. 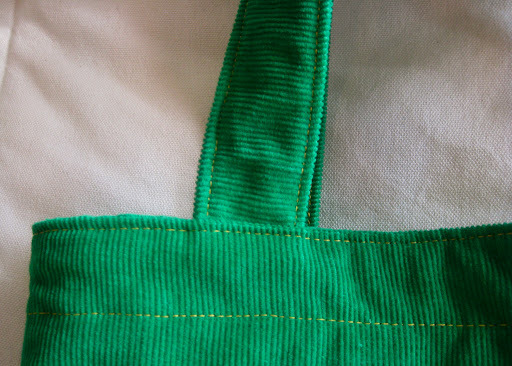 if you baste first, you can easily check to see if everything lines up satisfactorily. on a shorter zip i usually just pin it in place and hope for the best. oh, you did finish your zipper seam allowance first, right? good. 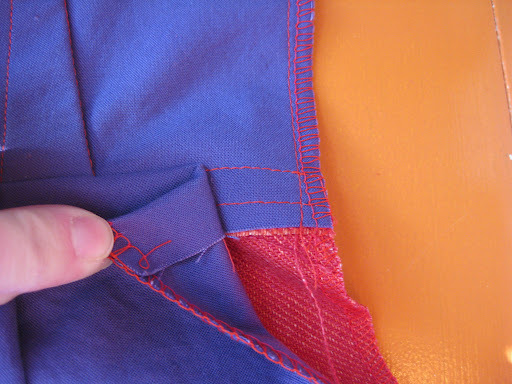 make sure that top zipper stop is 1/8″ down from your seam line at the neck opening. 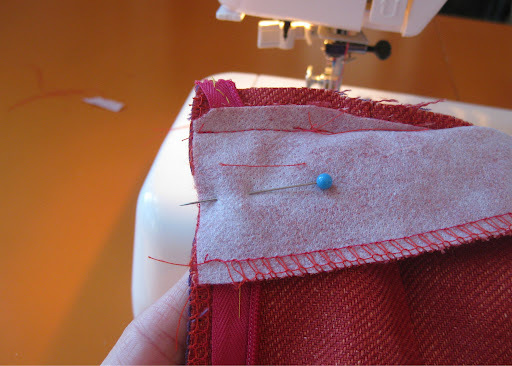 if you like doing a hook and eye at the top (i don’t) align the zipper stop about 1/2″-1″ down. now, stitch it in! i usually do a long stitch, 3-4 mm. 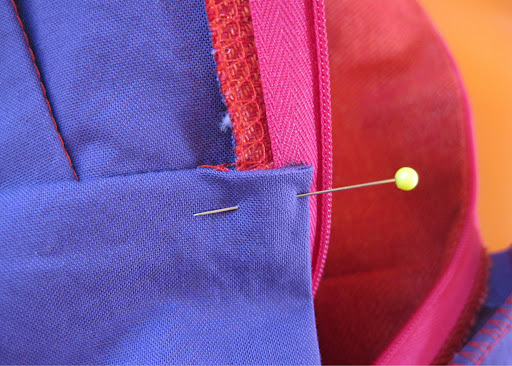 once you have sewn both sides of your zipper, turn your skirt lining in and slipstitch it at the waist seam and down the zipper tape if you wish. fyi: i usually don’t bother sewing down the zipper tape. what can i say, i’m lazy. 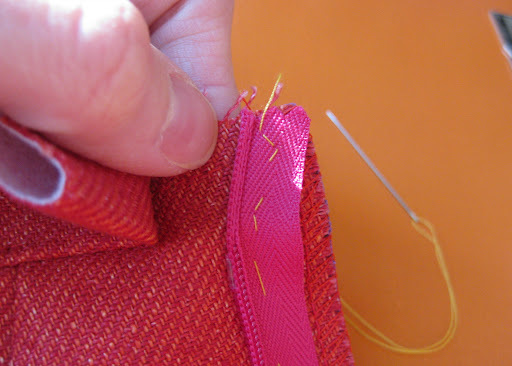 then switch to your regular zipper foot and sew down the side of the zipper. trim the heck out of that corner then turn it right side out. i trimmed it much more than the picture below shows, so you know. give it a good press and ta-da! you have a perfectly finished zipper with neck facings and skirt lining! 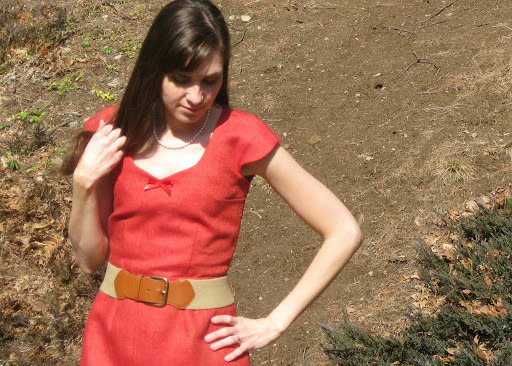 next up, the pastille dress from colette patterns book. i went into this pattern with knowledge about some tweaks i would have to make. i’ve read other people’s reviews on it and seen some serious fitting issues going on in the back! so, thanks to the awesome interwebs, i went into my muslin taking all this into consideration. first, the front: colette patterns are designed for women with an “average american bust.” i, however, am not so “average american” in this respect. so, i knew i would have to do a serious sba to make it work for me. 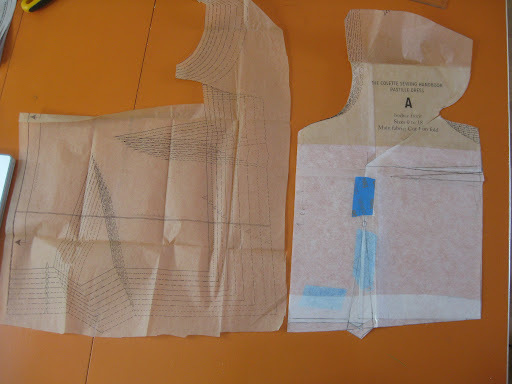 also, i had been studying how to draft a basic bodice block from a pattern making book and discovered that my dart intake is only 1 1/2″ -2″, whereas this pattern has more than a 4″ dart intake. uh… yeah. i only had to look at the pastille pattern pieces to know it in no way would fit me as is. not even close. i won’t go into details over the sba right now because some searching led me to a very good tutorial. 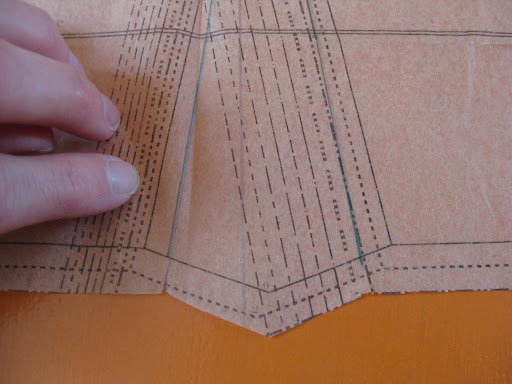 it’s easy and totally demystifies how to reduce a darted bodice, something i have struggled with in the past. i highly recommend checking it out here. on to the back: so, i’ve seen that people using this pattern have had some seriously excessive amounts of fabric going on in the back. since i’m rather narrow on top anyway, i decided to cut the back a size 0, but reduce the dart intake at the waist to give me the size 4 width at the waist. 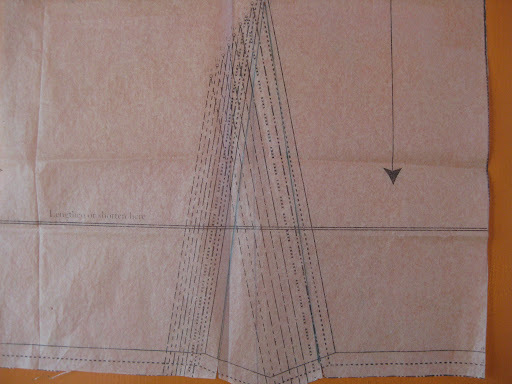 to do this, i marked the innermost leg of the dart on the size 4 line (on the seamline), but narrowed the dart and redrew it (this ensures that the dart is in the right place to line up with the skirt dart). did you follow that? 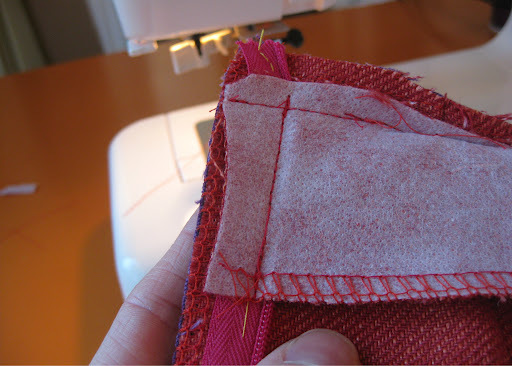 instead of adjusting my side seam (transitioning from a 0 down to a 4 at the waist) i just went with the smaller size then added width by taking a smaller dart. i noticed that many of the fitting problems others had seemed to be caused by excess fabric vertically and this adjustment took care of that for me. i know that isn’t the clearest explanation ever, if you want more details just ask and i’ll be happy to clarify! all in all, it worked out really well and my muslin fit almost perfectly. i still had a little extra in the bust i had to reduce, but that was pretty much it. success! oh, wanna see my fabric? it’s a red, cotton-rayon blend with a twill weave. loooove this fabric. it’s so chic, classic and perfect for the winter/spring transition. and the best part, i got it for less than $3/yd. so basically, this dress (with lining) cost me less than $20. i didn’t intend to blog about this last project i made, but it turned out so cute i just couldn’t resist sharing! 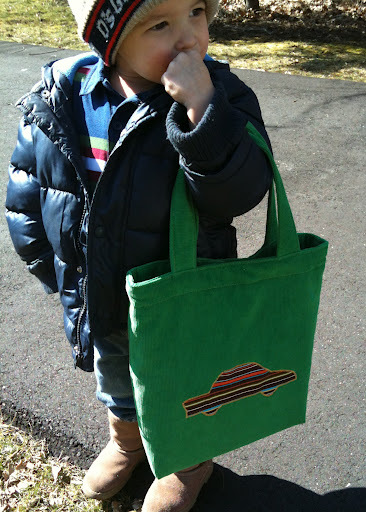 my three year old son started preschool a few weeks ago and was in need of a tote bag to carry papers back and forth to and from school. since i’m too cheap to buy something when i have perfectly good scraps of material wasting away in a box, i decided to make him one. now, i put it off and put it off because i thought it just seemed like a boring project. however once i got started, i was surprised by how much i enjoyed making this little bag! the more details i incorporated into the bag, the more excited i got about it. 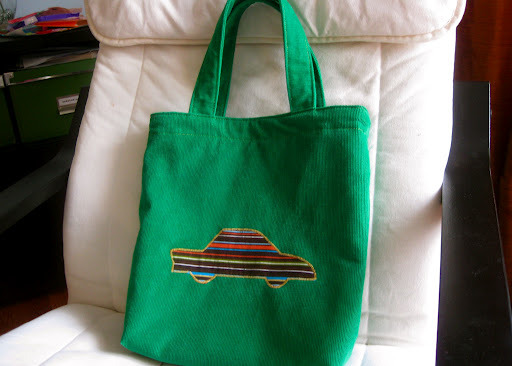 i haven’t made tote bags or purses or anything like this before, but i’ll definitely be making some in the future. this is a simple bag, just big enough to hold papers and folders or books from the library. 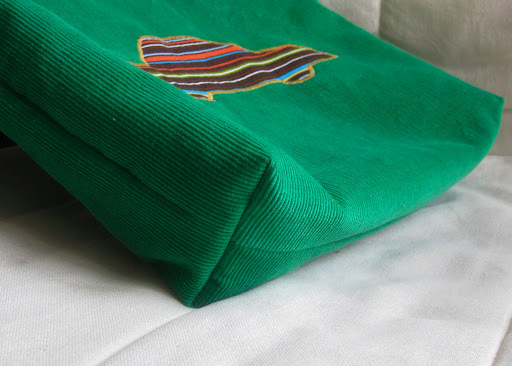 i had some green corduroy leftover from a skirt i made last year and i figured it would be durable enough. plus, green is his absolute favorite color… it’s like it was meant to be. 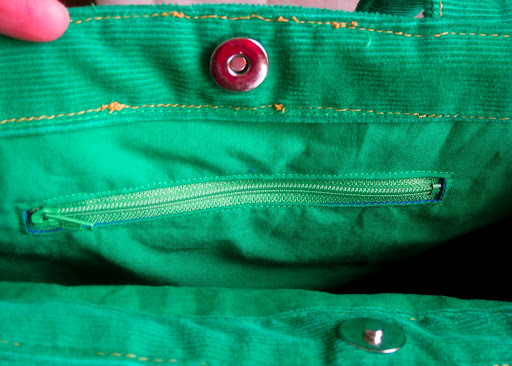 i fully lined it in green cotton, and even added a zipper pocket on the inside to hold his snack or small items. please excuse all the tied off threads! i wanted a simple applique for the front, something that wasn’t too little boy-ish so he can hopefully use this for a few years to come. 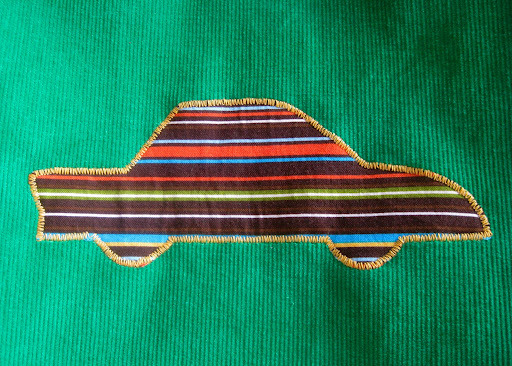 i drew a car silhouette which i cut out of some scraps of stripy material i had laying around. i added some fusible to the back of the applique to keep it sturdy, then just zig-zagged around the edge attaching it to the front panel of the bag with top stitching thread. i wasn’t sure if it would be cute or just look homemade (oh the horror!) but it turned out even better than i had hoped. seriously cute stuff. 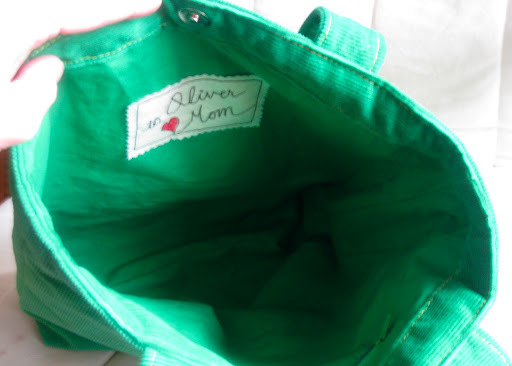 i faced the top edge of the inside of the bag and added a magnetic snap (love those! so easy to put in!) and of course, straps. now, i thought—hey wouldn’t it be cute if i had the cords running side to side for the straps? bad idea. made it nearly impossible to turn the straps right side out! i ended up wasting two whole hours of my life working on those little buggers! i needed a tag for his name on the inside, so i decided to go all out. 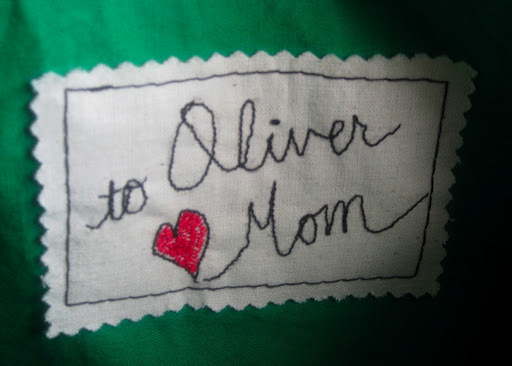 i drew out a little message in pencil, added some fusible to the back and just stitched away on my machine! not too bad for a first try at freehand label making if i do say so myself. this is mine? it’s green?! and a snap?!!!! and a car?!!!!! seriously, this boy could not contain his happiness. warms a mama’s heart.